VRBO stayed at our condo! Be sure to read the review below. Newly renovated including new flooring and larger HDTV in the living room! We provide 5 Star luxurious L'Occitane amenities for all rentals (as found in Four Seasons hotels). With its direct views of Aspen Mountain, this Chateau Roaring Fork condo is centrally located an easy 3 block walk from the main Gondola and the heart of downtown Aspen, CO. The complex features one of the largest outdoor heated pools in Aspen and two hot tubs, open year round. This LARGE Deluxe level 2 bedroom 2 bathroom corner unit provides dramatic views of Ajax mountain from the family room and wrap-around patio (with BBQ). The Kitchen has been recently renovated and features stainless steel appliances and granite countertops. There are separate Washer and Dryer. The Living room has unbelievable light and has a wood burning fireplace, flat screen TV with Cable, WiFi, and iPad stereo. There is a dining table and bar stools, both for 4. The bedrooms are very spacious for this complex and have a King bed in each room, Flat Screen TVs, and luxurious 500 thread count linens. Enjoy the scenic outdoors and decompress from your everyday life in the comforts of Chateau Roaring Fork. Property has large private swimming pool and hot tub that is available to guests. Aspen is well-known for its world-class skiing and was rated one of the top 50 ski resorts in North America by Conde Nast Traveler Magazine. It also offers a variety of recreational activities to include mountain climbing, horseback riding, fly-fishing, hiking, and ballooning all while enjoying the breathtaking beauty throughout the year. Chateau Roaring Fork is steps away from the world-class restaurants, boutiques, galleries and nightlife that make Aspen legendary. Property is everything advertised in terms of cleanliness, very well appointed , walking distance to lift, very nice heated pool, hot tubs , new appliances etc ., would certainly ask for this same lodging next year ! Perfect place to stay for a ski weekend - well-maintained, clean, and an easy walk to town and gondola base. This is a great property and location if you are visiting Aspen. The condo is equipped with all the amenities you'd expect to have at home. 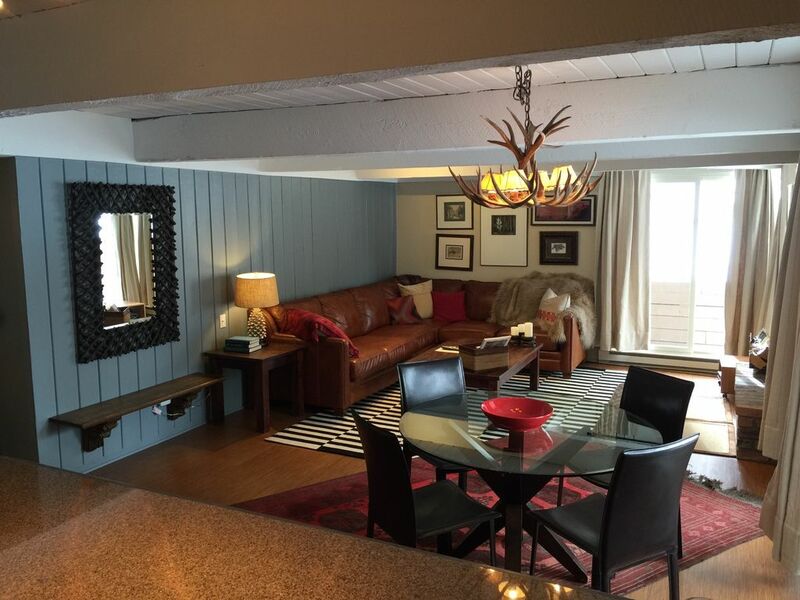 It is a few blocks walking distance to downtown Aspen, grocery store, boutiques, etc. This was our first time visiting Aspen and staying at this condo was perfect for us. Will book it again! Our second time staying at this location and we loved it just as much. Location is convenient - far enough from the center of town so as to be quiet but close enough to walk to everything including the lift and transport center (there’s also a free bus stop right across the street from the unit). Less than 5 minutes walk to the market. Great place to share for two couples. We’ll definitely try to stay here again. The condo was perfect for four people! It was a five minute walk to town. We also enjoyed the pool and hot tub each day after hiking. We do not charge a cleaning fee. Confirmed bookings require a signed contract and refundable damage deposit.